Ready to add some definition and dimension to your complexion? 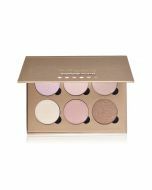 This palette contains six shades to help you highlight the areas you want to bring out, or contour the areas you want to slim down. We have included these step-by-step instructions that make contouring and highlighting easier than ever. Ethylhexyl Palmitate, Ocvtyldodecanol, Silica, Ozokerite, Beeswax, Squalane, Microcrystalline Wax, Phenoxyethanol. May contain +/- Titanium Dioxide (CI 77891), Iron Oxides (CI 77491, CI 77492, CI 77499). Step 1: Begin by determining your face shape with the Face Chart. This will be your guide for recommended placement of contour and highlight creams. 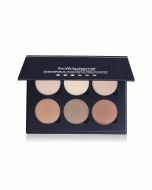 Step 2: Using any of the three contour creams on the bottom row, apply this with a small makeup brush anywhere you want to slim or define your features. Typically, this cream is applied on the outer edges of the forehead, on either side of the bridge of the nose, underneath cheekbones, and along the jawline. Step 3: Blend the contour cream using a sponge or angled makeup brush, there should be no harsh lines if you want this to look natural. Be sure to blend any contour cream on your jawline down toward your neck. Step 4: Next, choose any of the three highlight creams on the top row. These can be used on any areas you want to emphasize or bring forward. Using a small brush, apply the highlighter from your lower lash line to the top of your cheek bone, filling in the area of skin in the middle (this should be quite a large surface area). Then, apply the highlighter down the bridge of your nose, Cupid’s bow, chin, and center of your forehead. This will bring out your key features which usually appear dark and puffy, to make them look brighter, healthier, and fuller. 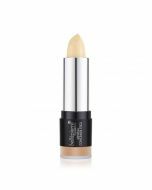 Step 5: The final step is to blend the highlight cream using a sponge or dense makeup brush. Now you’ve finished contouring and highlighting like a pro!